This article was first published via Mashable. Secretive design language is widely used on web sites as “Easter eggs,” within products as hidden features, as hidden offerings by food providers (In’N’Out’s secret menu or Bible citations on the packaging, for example) and even on passports as security enhancements, like Norway’s next passport design. Utilizing design secrets to share underlying themes is a powerful brand statement — one that helps gain buzz and keeps believers lining up for more. Very much like the speakeasy that has no sign out front and is incredibly hard to find, we are attracted to brands that challenge us intellectually and hide elements from plain sight. Seeing and connecting them makes us feel special, and that is one wonderful feeling that a brand can trigger within their audience. Here are two ways your brand can turn to the subliminal to get its audience engaged. Brand identities, or simply ‘logos,’ are the most common place to find hidden messages and deeper meaning at the very top of the visual brand pyramid. The arrow between the letters ‘E’ and ‘x’ in the FedEx logotype is the go-to example for subliminal messaging in logotypes, but you can find them all around you. As shown by Amazon’s “delivering a smile and products from A-Z” and Baskin-Robbins’ “31 flavors,” key messages are often hidden within a logo. Today’s clever tech startups that understand the power of brand story telling are right on their heels. A brand’s identity needs to say many things, and graphic designers go beyond the obvious to achieve all, or at least most, of the objectives, having to pull out some visual tricks to fit them all in. Once the audience finds out about a hidden element in the brand identity, it feels more connected to the brand itself, as if it’s part of their secret. We love sharing that secret with others. Today, we call that virality. Your logo alone can get people talking about the deeper meaning behind your brand. Your Brand Atmosphere is your visual foot print. It is what your audience sees when they get in touch with your brand image. It’s everything from your collateral and online presence to trade show booths and your email signature. Brand Atmosphere represents another opportunity to tap into the power of hidden design language. When my brand consultancy was asked to create the visual image for Martian Ranch and Vineyard a few years ago, we were thrilled to learn that the name actually stemmed from the founding couple’s sons, Martin and Ian. Cleverly, they put the two words together to formulate a name for their next big offering, the winery Martian. 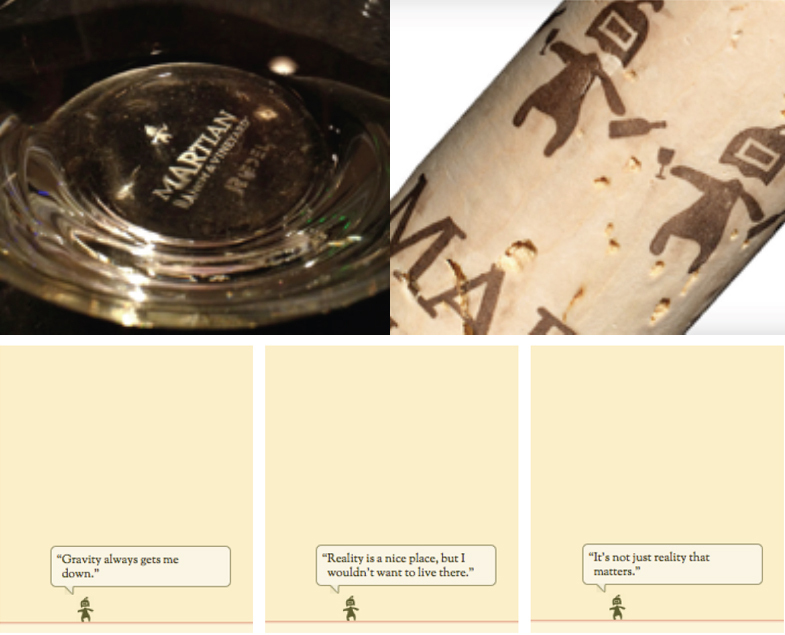 Given the name, the client’s directive from the get-go was to craft a Martian character to grace the wine labels and represent the Martian brand. My agency, however, did not love the thought of being greeted by a Martian, not with a $22-$35 bottle of biodynamic California wine and a brand that stands for much more than what the name implies. Ensuring a happy ending, or a happy landing so to speak, we allowed the Martian to make its way into the brand’s design, but we restricted its appearances in a refined manner. When a consumer opens the bottle, for example, Martians are dancing around the cork, drinking in a festive manner. Then, when a site visitor goes to Martian’s landing page (no pun intended) for longer than 30 seconds, a tiny Martian character beams itself onto the site. It shares random thoughts like “Reality is a nice place, but I would not want to live there.” Needless to say, the Martian hunt was on and the buzz quickly spread, one glass at a time. All it took was one extra layer being subliminally added to the design language. You need to dig deep into the core values of your brand. Is it humor, like Martian, or is it choice, like Baskin-Robbins? Incorporating hidden design language that speaks in unison with your brand values is useful and cost effective; you’re already going to pay to develop your brand’s identity and visual atmosphere. Let the cleverness of your brand speak quietly, and you will hear the echo from your audience.